An amazing mountain sleigh ride is the memory maker for any Colorado vacation. Copper Mountain area has stables and outfitters that can take you on a scenic or hot cocoa mountain tour, or out for scenic evening ride with dinner and entertainment. 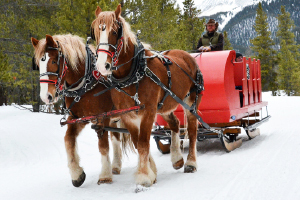 Copper Mountain, Colorado area has unforgettable sleigh rides, great for all ages and fun for the entire family while visiting Copper Mountain area.